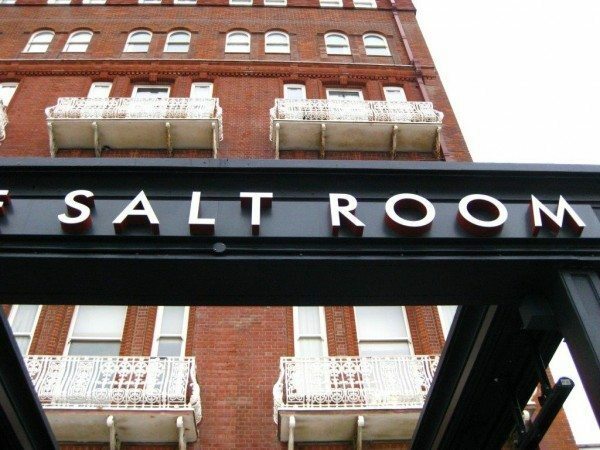 The Salt Room is a brilliant recent addition to the Brighton food scene headed by the talented folk who brought us the award-winning Coal Shed. It bills itself as a modern seafood and grill restaurant, which celebrates the fruits of the sea and champions sustainable local produce. 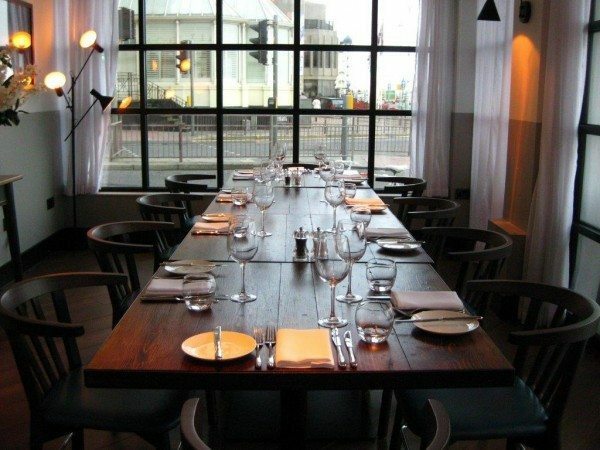 This magnificent restaurant sits at the corner of the Metropole Hotel on Brighton sea front, opposite the West Pier and near the Brighton i360. The first thing that hit me was that the layout is absolute genius! 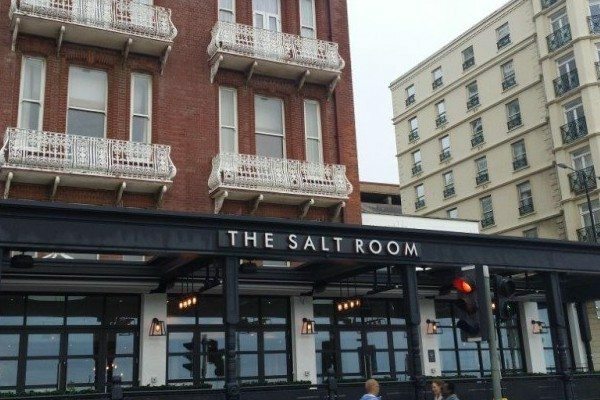 As you walk through the huge glass doors you are immediately hit by delicious smells drifting out from the kitchen, which is just beyond the spacious bar area. So after you are greeted by the lovely lady at the front desk you can wet your whistle in the candle-lit bar, allowing the tantalizing smells to waft over you, tickling your taste buds into action, and even get a sneaky peak into the kitchen through the chef’s pass. Once in the restaurant itself you get a real sense of the true vastness of the place. However, this doesn’t detract from the intimacy of your meal because tables are well spaced and the general buzz means your conversation is yours alone. 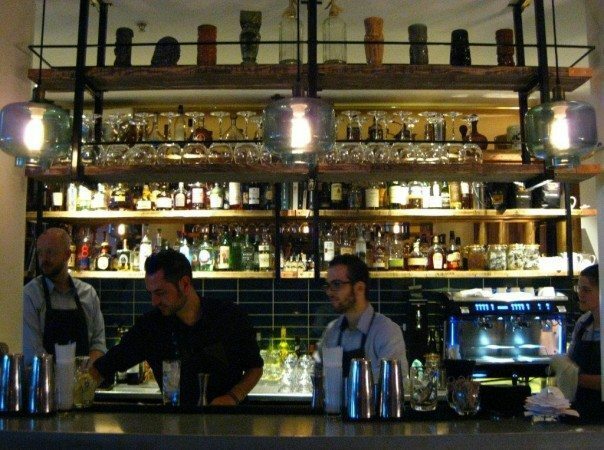 There is an impressively high number of unobtrusive waiting staff, so the size of the restaurant does not negatively impact on the service either. Quite the contrary. Our glasses were never empty and there was always someone on hand whenever we needed anything. The décor throughout is absolutely stunning. There are beautiful bare brick walls, plenty of natural wood, a huge array of gorgeous, stylish light fixtures and the dark wood flooring and chairs set the perfect back drop for the abundant, gleaming, reflective surfaces. 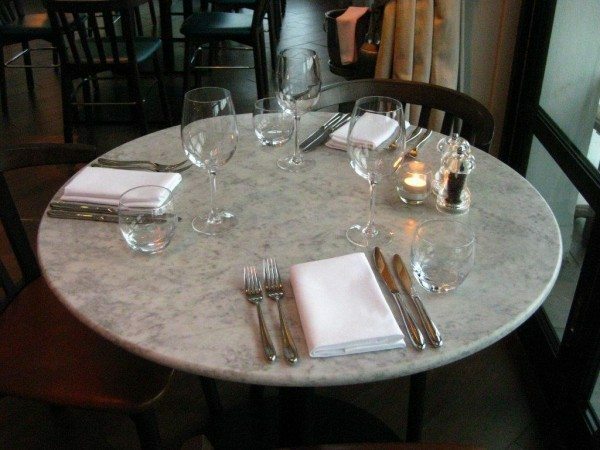 Everywhere you look there is evidence of exquisite attention to detail, from the immaculate and perfectly folded white linen napkins, to the natty little wine cooler that the waiter hooked onto the edge of our marble topped table. I can’t help but give the toilets an honourable mention here too. They are hands down the sexiest toilets I have ever visited, with dark slate walls and moody in-set lighting. Fixtures like the toilet roll holders and coat hooks were made from copper plumbing pipes and fittings, which was a snazzy little touch, and the beautiful smelling soap and hand cream wouldn’t be out of place in a high-end spa. Everything was spotless and highly polished and the service was impeccable. As the waiter placed Andrew’s side plate on the table he noticed a, to my eye imperceptible, blemish and immediately removed and replaced it. When our wine was brought to the table the waiter smelled the cork to check the wine was good then asked who would like to try it, which was refreshing as generally the honour is automatically offered to Andrew. The timing between courses was ideal, leisurely enough to allow you soak up the atmosphere but you never felt that you were kept waiting or that you’d been forgotten. The atmosphere was electric, there was barely a free table and people were clearly genuinely excited to be there. Everyone was dressed up to the nines and I’ve never seen so many smiling faces. We decided to get the show on the road by ordering a lovely crisp, dry, French Chardonnay which we knew would complement the seafood perfectly. 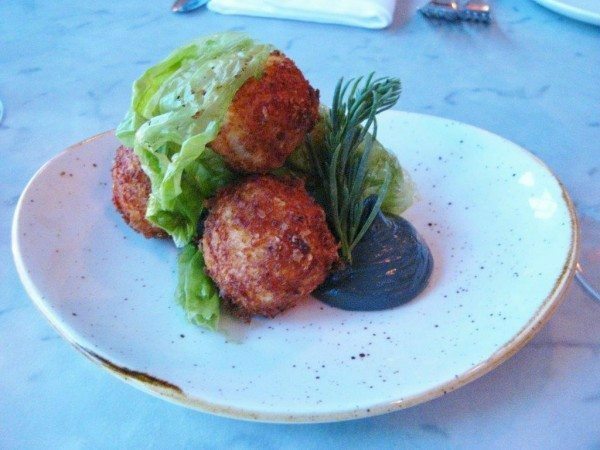 We were then delivered a little plateful of utterly delightful salt cod fritters with smoked cod’s roe as a pre-starter nibble. They had a lovely crunchy exterior and a soft melt-in-the-mouth filling of cod and fluffy potato. They were excellently seasoned and tasted divine dipped in the extraordinary, dusky-blue, salty roe. It was literally mouth-watering! 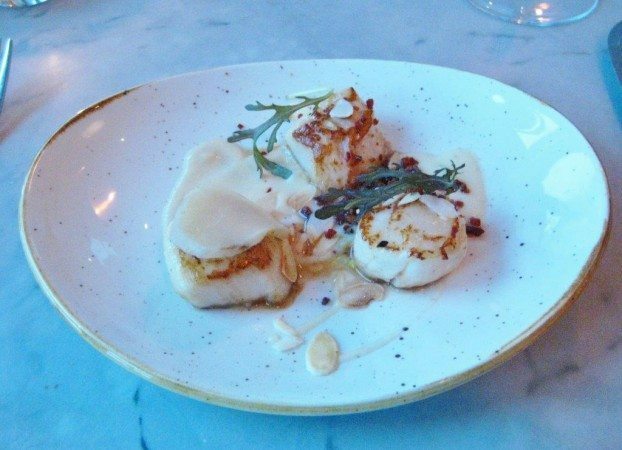 Next we were delivered starters of scallops with bacon crumb and toasted almonds on a delicious silky smooth purée (maybe artichoke, my memory fails me). The scallops themselves were heavenly. They were exquisitely tender and juicy, with a delicate, sweet flavour, just caramelised on the surface and undeniably fresh. These sublime little morsels were perfectly complemented by the saltiness from the crisp bacon crumb and the crunch of the almonds. Then for the main event, and the reason we were actually there, the South Indian fish burger. When it arrived at the table it looked very appealing and smelled wonderful. 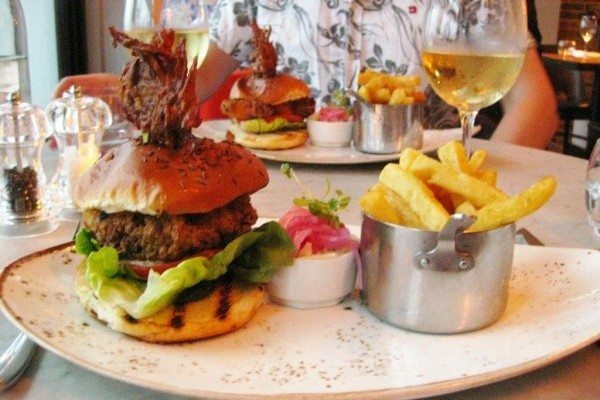 The burger came in a griddled seeded bun with a perfectly browned onion bhaji skewered to the top. It came with chips, pickled red onions and a green chilli coleslaw. The bhaji was crispy with a soft, moist centre, delicately spiced and aromatic with cumin. The chips were golden, crunchy, fluffy in the middle and generously sprinkled with salt, delish! The burger itself had a gorgeous, crunchy coating and inside was packed with perfectly seasoned, delicate, flaky white fish. It was finished with a lovely, crisp, fresh lettuce leaf and a thick slice of juicy, ripe beef tomato and an intensely herby apple relish. A refreshingly different take on a culinary great. For me, the star of the show was the unassuming little dish of coleslaw and pickled red onions. Coleslaw is often a bland and unremarkable addition to the plate, a space filling nod to the humble vegetable. Not so in this case, it was absolutely glorious! Fresh, crunchy vegetables in a light, tangy, creamy sauce with a fantastic fiery hit of green chillies, lush! To go with dessert Andrew ordered an El Cantinero (Havana Club 7yo, coffee beans, honey, bitter wash). It came in an ice cold glass and was sublime, bitter-sweet with an intense coffee hit. I had a glass of Clos Dady Sauternes. Chilled golden nectar, and a perfect accompaniment to any dessert. If you want to go all out you should try their spectacular-looking signature dessert “Taste Of The Pier”, which includes a mint choc chip “99”, raspberry marshmallows, candy floss, doughnuts, pebbles and fudge. I don’t have a particularly sweet tooth so I opted instead for the dark chocolate ganache, cherry sorbet and pistachio sponge. It was incredibly colourful and looked amazing. The dark chocolate ganache was smooth as silk, richly indulgent and surprisingly light, divine! The cherry sorbet was the brightest red you can imagine and tasted powerfully of cherry without being too sharp. The pistachio sponge was light and nutty and the three went very well together. 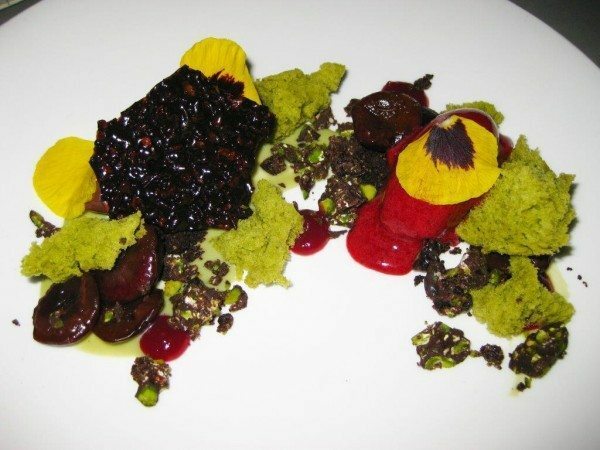 However, there were other little gems on the plate too, juicy macerated cherry pieces, little, sweet, chewy nuggets of pistachio chocolate brownie, a very pretty, crunchy shard of what looked like it could be pomegranate brittle and, just in case it wasn’t pretty enough already, a sprinkling of edible flower petals. Andrew had the Apple, crème fraiche sorbet, Hendrick’s jelly and elderflower trifle. I was only allowed a small taste but it was heavenly! It was exceptionally refreshing, sweet, juicy, with an intense green apple flavour and the occasional heady hit of gin. The perfect palate-cleansing finish to a truly exceptional meal out. We left feeling happily replete and thoroughly spoiled!